Jill Girardi holds the ball. 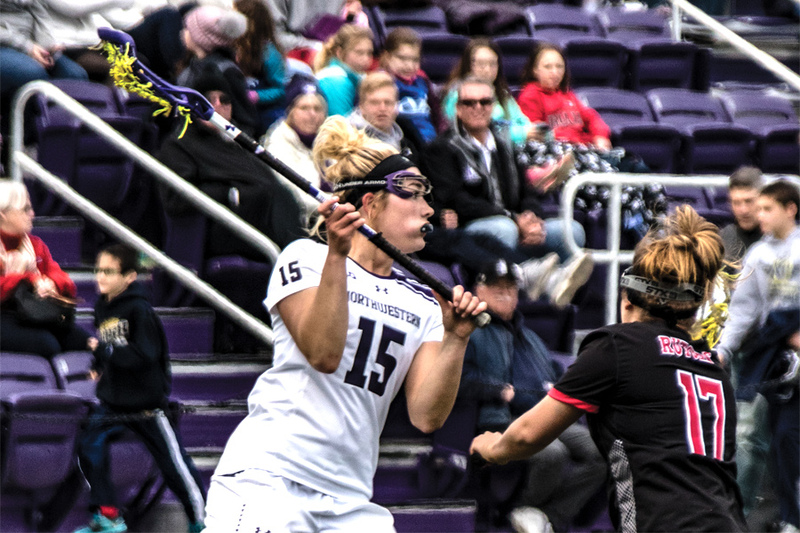 Northwestern opens its season against Louisville on Friday. Despite dealing with all the pressures that come with being one of the country’s most prestigious programs, No. 7 Northwestern sounds like it’s playing with house money. For the team, it’s important to not to confuse high spirits with a lack of focus heading into the first match of the season, Friday at home against Louisville. According to coach Kelly Amonte Hiller, the Wildcats have centered on getting better each day, tackling the season one game at a time and bringing intensity to each practice. Following a 2018 season that ended with a disappointing loss to North Carolina, Lasota said NU has found a new mentality to match its new facility, Ryan Fieldhouse. The team is focused less on results and much more on playing in the moment, Lasota said. Although they’ve shifted their mindset, the Cats’ current sights are set on the Cardinals. NU opens the regular season against an unranked Louisville team that lost ten of its final 11 games in last year’s campaign. Though playing a developing program, Amonte Hiller was focused on all three aspects of the game. The last time the Cats played Louisville in 2017, the Cardinals were under the guidance of coach Kellie Young. In the matchup two years later, Louisville has new leadership, and NU is hosting games inside an improved facility. Lasota emphasized the importance of unity within the team, whose roster has 20 underclassmen. The team’s depth will be crucial this year as Amonte Hiller seems content on riding the hot hand at goalkeeper and draws. Amonte Hiller also said this season’s schedule leaves them no room for error, even though their first three games are at home.